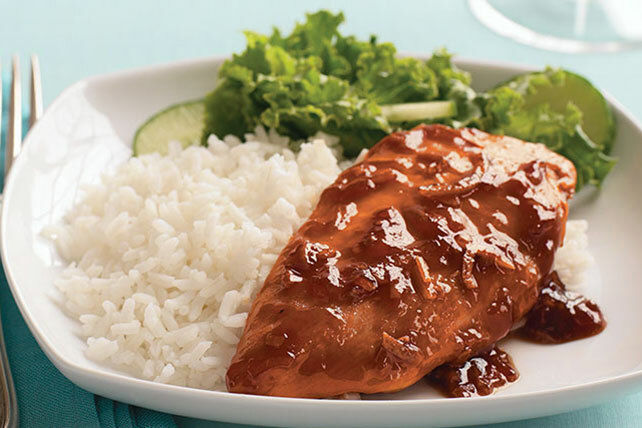 Deliver exquisite flavor with CATALINA Chicken Breasts. CATALINA Chicken Breasts use a mix of Kraft Classic CATALINA Dressing, apricot jam & onion soup. Heat oil in large skillet on medium-high heat. Add chicken; cook 4 min. on each side or until browned on both sides. Transfer chicken to 3-qt. casserole. Mix dressing, jam and soup mix; pour over chicken. Bake 35 to 40 min. or until chicken is done (165ºF). Serve with hot cooked rice and a mixed green salad tossed with your favorite KRAFT Lite Dressing.